Cold water soak – Fill the barrel 1/2 full with room temperature water and let stand for 2-3 hours, rotate 180 degrees and let stand an additional 2-3 hours. Empty and let sit overnight. Next, fill the barrel with water and check for leaks. If small leakage occurs, let stand 2-3 hours until the barrel swells, stops seeping and seals itself. The drain the water and fill with wine. Hot water soak or “French Method” – Fill the barrel with about six gallons of hot water. Insert the bung and slosh the water around or rotate the barrel on its rack so the water comes into contact with all the interior surfaces of the barrel. Next, stand the barrel on end and fill the head area (on the outside) with hot water and let it stand for 15 minutes. Repeat for the other side/head. Check for leakage or seepage throughout this process. Then drain the barrel. If no seepage was noted during this process, fill the barrel with wine. Pressure method leak test – Attach a pneumatic fitting to a hard rubber barrel bung. Fill the barrel with about six gallons of water and slosh the water around or rotate the barrel on its rack so the water comes into contact with all of the interior surfaces of the barrel. Insert the bung and pressurize the barrel to approximately 10-15 psi. Rotate the barrel slowly to allow the water to sit on each interior surface area and check for leaks during the rotation. If no seepage was noted during this process, fill the barrel with wine. 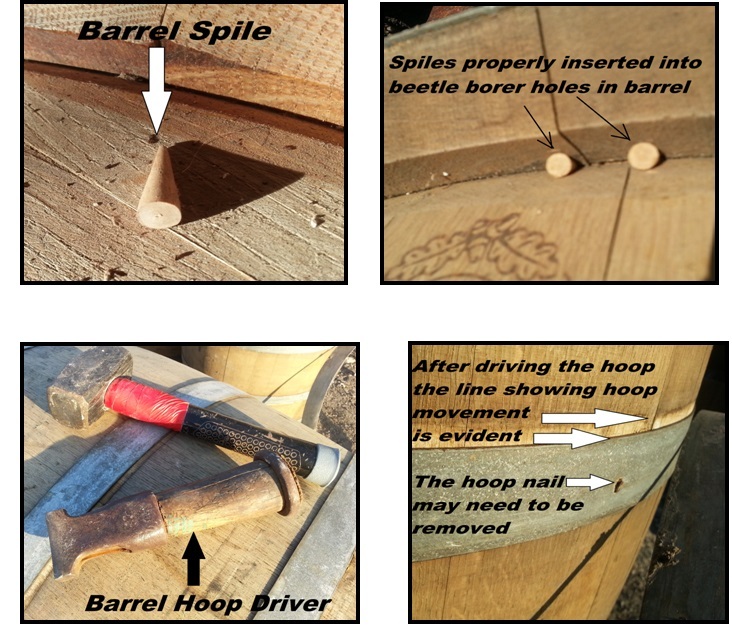 Spiles – Where the point of leakage can be determined, tap barrel spiles (conical wooden plugs) into the holes or gaps found to be causing leakage (see photos). Start by inserting an awl – or bradawl – into the hole to allow better insertion of the spile, the use a metal punch or wood punch to tap the spile into the hole. Use small wooden wedges for side stave gaps or cracks found to be causing leakage. Hoop Tightening – The hoops can become loose when the barrel becomes dry. Using a hoop driver or, if no hoop driver is available, a cold chisel to hammer the hoops toward the center of the barrel. Work around the barrel, hammering firmly at around one-quarter increments of the circumference. It may be necessary to remove the hoop nails to allow the hoop to slide tighter onto the barrel. Note that whichever method you use to swell your barrel, never allow the same water stand in the barrel for more than 2 days. If the soaking period will exceed 2 days, drain the barrel and refill with fresh water. This will prevent bacteria and microbes from beginning to form in your barrel. Once filled and leak free, be sure to routinely inspect each barrel and the floor below barrel stacks for evidence of new leakage, especially after topping or removing the bung for any reasons where the natural vaccum that develops within the barrel is breached. Most importantly, enjoy the wine that finally comes out of your barrel the correct way… not through leakage!